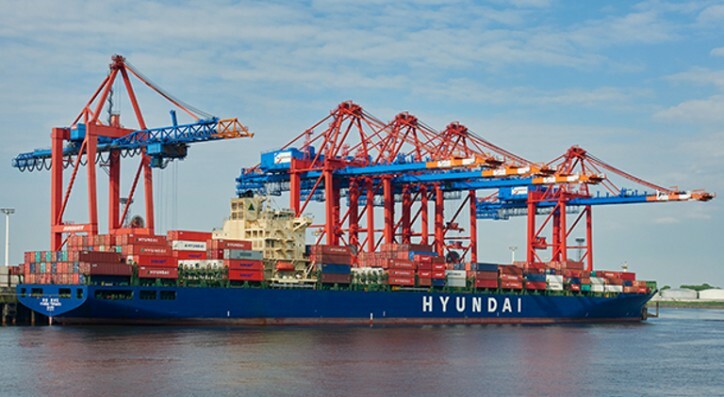 The MV Hyundai Forward moored at the EUROGATE Container Terminal Hamburg for the first time on Saturday, 12 May. The container ship is traveling as part of the re-aligned Asia Europe Express (AEX) service operated by the South Korean shipping company Hyundai Merchant Marine. The 4,700 TEUs carrier is one of ten vessels that will regularly connect Hamburg with Asia. In addition to Hamburg, the service also operates in Southampton and Rotterdam in Europe. In the Far East, the vessels, each of which measure almost 300 metres in length, will call to Busan, Shanghai, Ningbo, Kaohsiung, Yantian, Singapore, Hong Kong and Colombo. The transit time from Busan to Hamburg totals 32 days.